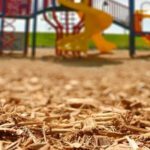 CDW’s KidCushion Playground Mulch is the smart choice for all your landscape and play areas and can be used anywhere wood mulch or other ground cover products are used. Not only does KidCushion Mulch provide one of the safest play surfaces in playgrounds, it is also safe for use around plants in the landscape. And since it does not attract insects (including termites) or pests and helps prevent weeds, it’s the idea landscape groundcover. Keep your yard and play areas looking great for years with CDW’s KidCushion Playground Mulch. Our mulch is so precisely manufactured that it is certified through IPEMA to be utilized as a playground mulch.